Many people choose to live in the country because they cherish the peace and quiet, the wide open spaces, and the beauty of nature. Today, however, I am going to talk about something that may not sound or smell that pleasant: onsite wastewater treatment systems. Understanding how these systems work and how to keep them operating efficiently is critical for your family’s health. It is also important to your household’s budget. The strength of the wastewater, such as solids, nutrients, organic matters, and pathogens. Fig. 1. 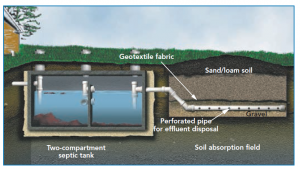 Conventional onsite wastewater treatment system (septic system). Generally speaking, a typical three-bedroom home with a 1000-gallon septic tank needs to have solids removed every three to five years. Smaller tanks must be pumped more often. Do not put this job off until the tank and sewer fill up and the toilet overflows onto the bathroom floor. If this happens, a new drainfield may also have to be installed. Believe it or not, any septic tank additives that promise to “clean” the tank do not actually clean the tank. They are either not significantly effective or may cause the solids to be flushed from the septic tank into the drainfield, causing clogging problems. Other compounds may produce a septic tank effluent which will destroy soil structure and cause premature failure of the drain field. In recent years, the use of products such as “flushable” wipes have been advertised as a better cleaning experience when compared to traditional toilet paper. These products are marketed in a variety of ways, such as “septic-safe”, “break down like toilet paper,” and “safe for sewer and septic.” The problem is that they appear to take longer to break down when compared to traditional toilet paper. As a result, they have caused major blockages in sewer systems and have to be manually removed. Wipes that clog pipes can also lead to blockages that can cause sewage overflow into the house. Keep in mind, everything that goes down your drains ends up in your septic system, whether you flush it down the toilet, grind it in the garbage disposal, or pour it down the sink, shower, or bath. What goes down the drains affects how well your septic system works. An easy rule of thumb: Do not flush anything besides 4Ps. We all know the first 2Ps. The other two are paper and puke. Your septic system contains a collection of living organisms that digest and treat household waste. Think at the sink. Never pour cooking oil or grease down the drains. Eliminating or limiting the use of a garbage disposal will significantly reduce the amount of fats, grease, and solids that enter your septic tank and ultimately clogs its drainfield. Septic system maintenance is not complicated, and it does not need to be expensive. If you follow these tips, inspect and pump frequently, properly dispose of water, use water efficiently, and maintain your drainfield, you should have a nearly trouble-free system. Your septic system is out of sight but do not keep it out of mind! Water and energy educational programs.